A place thought long to be a myth exists in the deep canyons of the Wild West. 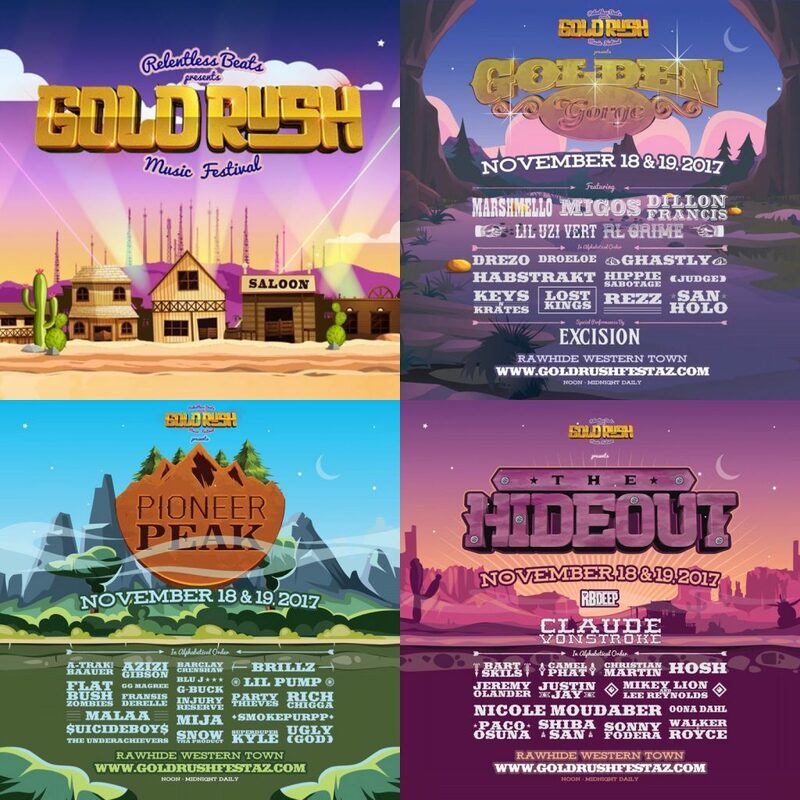 With the sonic echo of loud vibrations, mesmerizing lights, and the most sought after resource in all of Arizona… pure gold, welcome to the Golden Gorge, featuring: Marshmello, Migos, Dillon Francis, Lil Uzi Vert, RL Grime, Drezo, Droeloe, Ghastly, Habstrakt, Hippie Sabotage, Judge, Keys N Krates, Lost Kings, Rezz, San Holo and a special performance by Excision. Law-abiding citizens and bandits alike gather from all over the Wild West to celebrate the finest in hip-hop, bass, and dirty vibes. Showcasing the O.G. pioneers, along with those trailblazing into new territory, Pioneer Peak will feature: A-Trak b2b Baauer, Azizi Gibson, Barclay Crenshaw, Blu J, Brillz, Flatbush Zombies, Francis Derelle, G-Buck, GG Magree, Injury Reserve, Lil Pump, Malaa, Mija, Party Thieves, Rich Chigga, Smokepurpp, $uicideboy$, Snow tha Product, SuperDuperKyle and Ugly God. Outlaws of techno, house, and underground rejoice! This RBDeep fueled sanctuary was built with you in mind. Gather with like-minded citizens of the West and explore the musical frontier with sounds from: Claude VonStroke, Bart Skils, Camelphat, Christian Martin, HOSH, Jeremy Olander, Justin Jay, Mikey Lion and Lee Reynolds, Nicole Moudaber, Oona Dahl, Paco Osuna, Shiba San, Sonny Fodera and Walker & Royce. Leading up to the inaugural Goldrush Music Festival, Relentless Beats will be hosting a series of Goldrush Expeditions. Kicking off with Ghastly, K?d and Fight Club at The Van Buren on September 30th, before journeying to Salt for Tacos y Tequila with TM88 this past Friday, the series includes a mix of showcases and a DJ competition, all building towards one of the biggest events the Valley has seen. The next expedition will be October 20th, at The Van Buren and feature: Drezo, Wax Motif, Gladiator, Nukid, and Gerry Gonza. A final expedition will take place the night before the festival with Gina Turner at BFF at Bar Smith. Finally, the Goldrush Music Festival DJ Competition Finals will take place November 4th at the Monarch Theatre, with the winner receiving a slot at an upcoming Relentless Beats festival.